IT IS BETTER TO BE LUCKY! Whoever said it is "better to be lucky than good" knew what he was talking about. Yesterday my grandson and I hit the walleye goldmine of a lifetime. Never, ever, ever, have I seen such unbelievably fast, non-stop action. It was surreal. Nothing short of amazing. Better than anything I have ever experienced, in fresh or salt water, during the open water season or through the ice and regardless of the species or location. I am not kidding, it was faster than anything I've experienced on fly in trips in the Arctic. I am still wondering if it was a dream. 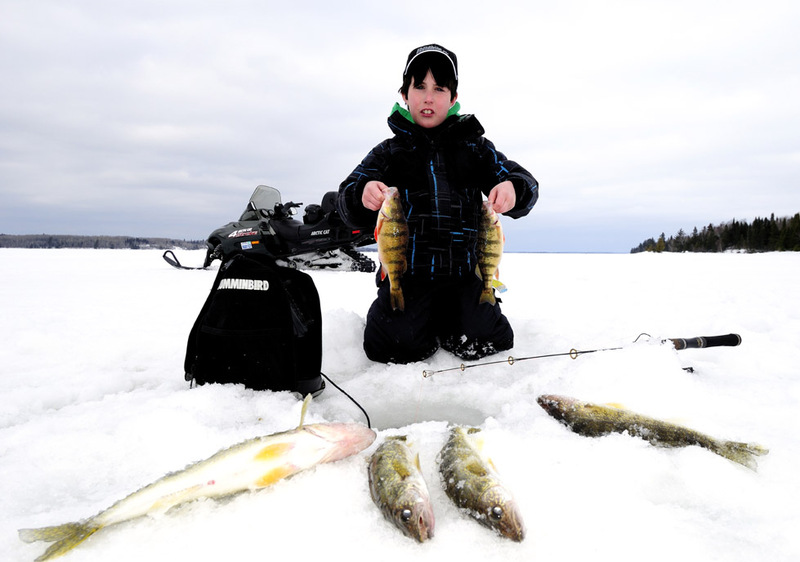 It is "March Break" in Ontario so the kids are off school this week and with the warm spring-like weather here in the Northwest part of the province it was the perfect excuse to pick up my eight year old grandson, Liam, catch a bunch of walleyes and perch, release the bigger ones and keep a few small fish for dinner. We accomplished our objective, but how we did it was extraordinary. After snowmachining a short distance we stopped on the GPS waypoint of a favourite walleye haunt and I drilled three holes. I turned on the Humminbird Ice 55 unit, put the transducer down the hole, saw that we were in 29 feet of water, zoomed in to highlight the bottom eight or nine feet and set up our jigging rods. I snapped a Glo Blue 1/4-ounce Mepps Syclops spoon on the end of Liam's line, twisted off the treble hook, slid a fresh shiner head through the eye of the treble and then reattached the hook to the Fastach clip on the end. By the way, if you're not using Fastach clips ( www.stringease.com ) on your spoons you're making a big mistake. They've been a closely guarded secret of mine for several years now and probably still would be had it not been for Doug Stange's intervention a few years back. Doug and I were filming an In-Fisherman Ice Guide television show and Doug knew I was keeping the clip-trick in my back pocket. So, as we were filming and I was landing a fish, Doug walked into the scene and with the camera rolling said, "Gord, why don't you tell the folks about that little clip on the end of your spoon." I was floored. I think I coughed and stammered and I know I laughed and said, "Well, it is really something I'd rather not show anyone." And I wasn't kidding. I mean, every once in a while you have to keep a few things to yourself .... right? Anyway, I demonstrated how to take the treble hook off your spoon, add the Fastach clip (which by the way, wasn't even invented for this purpose) to the O-ring and then reattach the hook. What the clip does is two things. 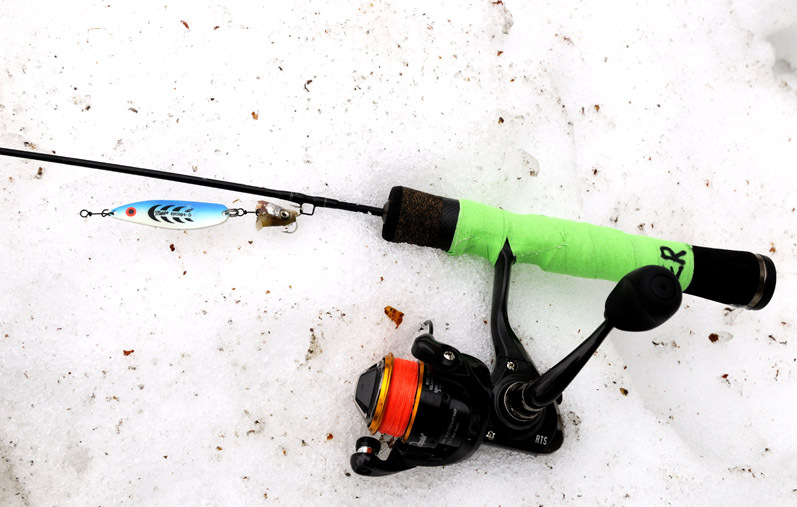 First, it separates the hook from your lure allowing it to pendulum much more easily into a fish's mouth. But equally important, when you flick off the head of a minnow, you can slide the eye of your treble (or single) hook through the minnow's mouth and out the cut off end. Then with a simple twist you can re-attach it to the lure so it is absolutely impossible for a fish to steal your bait without getting caught. And if you get a hit and miss the fish you don't have to reel up to put on another minnow head. You simply shake your spoon until the fish returns and hook him every time. Well, Doug now tells me that over the past few years In-Fisherman has received hundreds, maybe thousands, of letters and e-mails from viewers who saw the segment. And I know it is true because I've probably received another 500 e-mails and Facebook messages from folks who saw the short segment, bought the clips and caught fish like never before. The funniest messages of all, though, have been the ones from folks who remarked that they watched the segment Doug and I shot and said, "You know, I could tell you were really serious when you said you didn't want to let us in on that secret!" Anyway, the darned things work like a charm as Liam and I proved again last night. I don't know it if it was the action of the Mepps Scylops spoon, the Glo Blue colour, the Fastach clip, the minnow head or our specific location that was the important ingredient - probably a combination of all the factors - but for two hours non-stop, we literally caught one walleye after the other, with a couple of big bonus 13-inch jumbo perch thrown in for good measure. And when I say one after the other I am not kidding. Literally, you could not drop the spoon down the hole and not catch a fish. 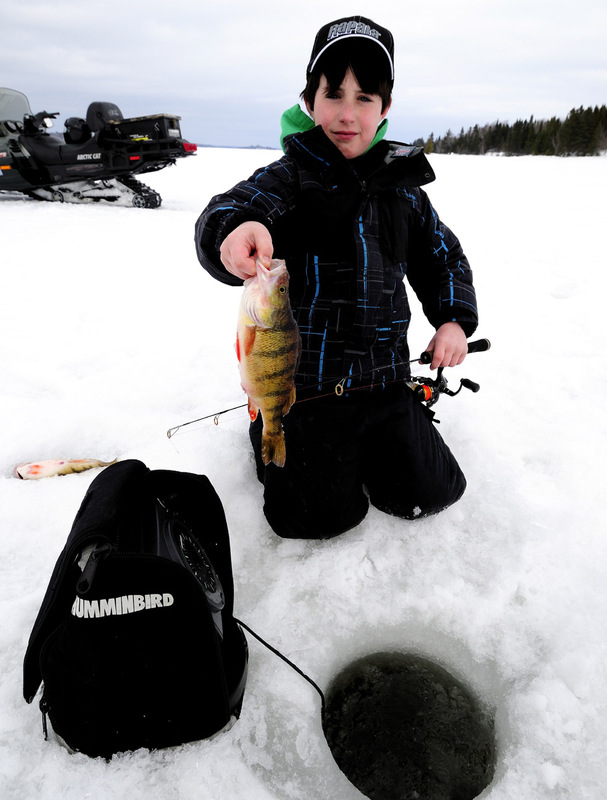 Indeed, I sat beside Liam on the ice, with the Humminbird sandwiched between us, and I would be exaggerating if I said he went 90 seconds between fish for the better part of two hours! I have never, ever, seen fish activity like this. But here is the strange part. Unless the lure was in the water we never saw a fish on the sonar screen. So, either they were lying belly to the bottom or they were hanging just off to the side. Yet the split second the lure dropped below the ice, even when it was still 10, 15 or more feet above the bottom and falling, the fish came flying onto the screen and we would watch them shoot up and intercept it. To give you a sense of how fast the action was, at one Liam stopped to have a drink of Gatorade, so I held his rod, and in the few seconds it took for him to take a short swig, I landed four walleyes. I simply can't even imagine how many fish were under our boots. Was it 100, 500, 1000, maybe even more? And they were feeding like piranhas. I mean it was slam, bam, thank you ma'am for two solid hours. As we packed up the sled and hopped onto the snowmachine for the ride back to the truck, Liam said, "Grandpa, that was the best fishing we've ever had." I had to agree - and I never even got to put my lure in the water!